IHM puts on events and history programs throughout the year, including interactive demonstrations, lectures and discussion, and local hikes and walking tours of historic Issaquah. IHM supports local and regional schools and student clubs through museum tours and history kits that cover a variety of topics pertinent to teachers in the classroom and beyond. A Family Activity Guide that promotes family interaction through education is available at the Depot Museum, where riding the Issaquah Valley Trolley is a popular activity. Formerly the Registrar at the Maine State Museum, Julie joined the IHM as a volunteer in 2006 and became a staff member in 2007. Julie cares for our artifacts and photographs from the moment they arrive at the museum. In addition to tracking what and where everything is, Julie follows museum best practices to ensure the long-term care of our collection. Julie lives in Newcastle, a former coal town on the other side of Cougar Mountain, with her husband and two furry feline wards, Melon and Cloud. Kris joined the IHM as a volunteer in 2015 and became a staff member in 2017. Kris is responsible for cataloging and imaging items for the Digital Collections, which include in-depth cataloging of letters, diaries, and other documents in our collection. Kris lives in Bellevue. Erica was the first employee hired by the organization. She began her tenure in 1999, a few weeks after earning her Master’s in Museology. She has been chief cook and bottle-washer ever since. Erica’s favorite projects focus on telling stories about Issaquah’s past, something she gets to do on history hikes, speaker’s presentations, and kids’ tours. Erica also has a soft spot for chickens, and for Issaquah’s poultry-farming past. She lives in Seattle with a husband, one cat, four chickens, and children Dylan and Conrad. Nicole joined the IHM in 2017. Nicole holds down the administrative fort and provides program support where needed – including schedule depot rentals. A native Alaskan, Nicole moved south to Washington state to pursue higher education. Nicole’s professional background includes some fascinating hands-on history, including working as a field assistant for the Hori Japanese Bathhouse Restoration at Neely Mansion, and as a conservation intern for historic statuary preservation at Lakewold Gardens, in Lakewood, WA. Nicole lives in Tacoma with her spouse, and a rescue dog named Mocha. In her free time, she enjoys reading and researching. Dorota joined the staff in 2015. Prior to her work here, she served as the Volunteer Coordinator at the Renton History Museums for 11 years.. If you think you might like to volunteer, Dorota is the person to call! Dorota also coordinates our museum tour program. Dorota lives in Sammamish with her husband and three daughters, Natalie, Charlotte, and Sylvia. 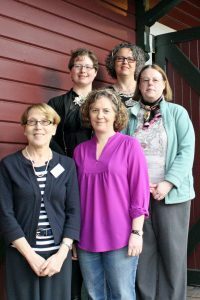 You don’t have to be a board members to contribute time to the Issaquah History Museums. We encourage community members to serve on our committees and working groups. Use the contact form below to get in touch if you’d like to serve on one of the following. Deaccessions: responsible for decisions concerning de-accessioned objects, and for making sure the IHM is following the Collection Management Policy. Items to be deaccessioned must be approved by the Board. Executive Committee: composed of the four officers of the Board and a Board member-at-large appointed by the Board. Duties shall be to discuss and make decisions on critical matters occurring between Board meetings, to review the performance of the Museum Director, and to make recommendations to the Board regarding personnel issues such as hiring, compensation and benefits. The Executive Committee is also responsible for board cultivation and recruitment. Trolley Committee: shall maintain, manage, and operate the Issaquah Valley Trolley. Ways and Means: strategizes how to fund the organization’s annual activities, and plans the organization’s annual fundraising calendar. Discover the Past: organizes the annual fundraiser. Marketing & Communications: responsible for the public relations and publications produced by the Corporation. The committee shall initiate actions to promote and market the Corporation and museums which will include media coverage, written material, and the Web site. Facilities: responsible for improvements to and maintenance of the Town Hall and Depot in accordance with the Corporation’s contract with the City of Issaquah, and maintenance of the Auto Freight Building. Finance: reviews detailed financial reports, makes decisions on accounting procedures and fiscal management. Programs: analyzes, evaluates, and strategizes ongoing organizational programs. Technology: assists in solving technological problems, and strategizing the IHM’s technological development. The Issaquah History Museums are a 501 (c)(3) non-profit organization, tax identification #23-7425589. The Board of Directors nominates new members on an annual basis. If you’re interested in volunteering as a board member, take a look at Board Expectations, and complete the contact form below.